The Internet has provided customers an open platform to discuss their experiences or opinions about a particular brand, service, or product. They leave behind reviews on platforms like Yelp, Google, Social Media Networks, and even on a company’s website. Consider it carefully first and make note of any genuine criticism you might find. Check your records for incident reports, complaints, or problems to see if there’s any evidence supporting the review. Communicate with employees and try to get to the bottom of the issue. Sometimes employees may forget to record small incidences. This will help you determine whether the review is real or fake. If you have no record of the incident, it is likely the report is false, but it’s still a good idea to double check. Respond to reviews within 24 hours if possible or on the next working day if it is placed during weekends. If the response is too delayed or if you don’t respond at all, prospective customers might question your commitment to customer service. Make sure the response is brief and doesn’t deny culpability outright. A defensive response will leave a negative impression on others. Don’t make any excuses, and maintain a calm tone in your response for best results. Let the reviewer know you take such complaints seriously but unfortunately, don’t have any record of such a transaction or interaction. 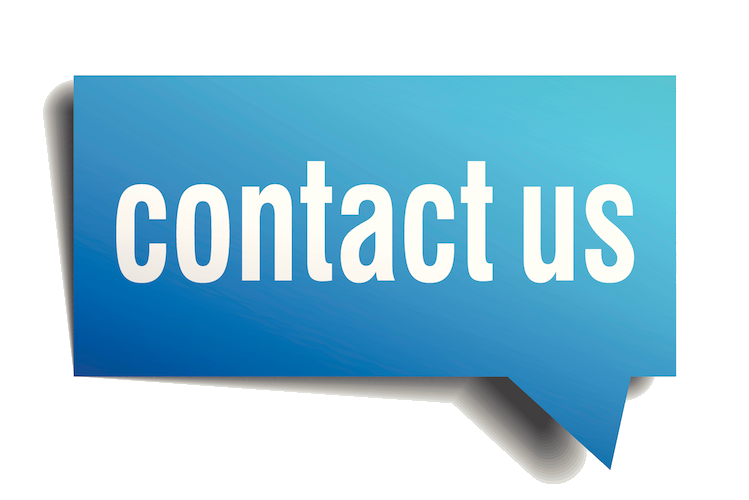 Provide contact information and encourage them to get in touch so you may resolve the problem. 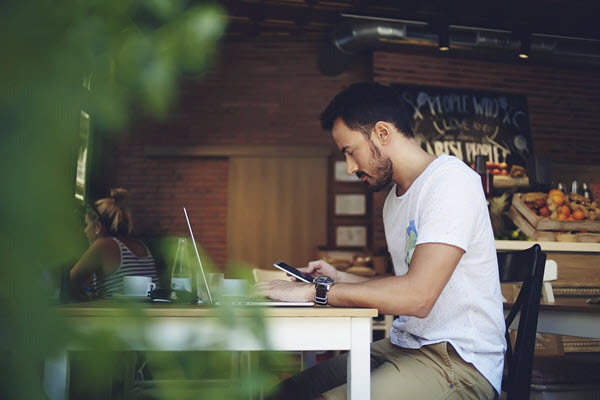 This leaves the window open for communication but still ensures you don’t have to worry about other prospective customers taking the fake negative feedback seriously. If you have promised something in your reply, follow it up with action. Making promises without fulfilling them is the quickest way to compromise your reputation. Make sure you’re always polite and professional while responding because even if the review is fake, it is on a public platform. Your professional response will leave a good impression on prospective customers and indicate that you take customer service seriously. Click on the flag icon at the top of the text. It is present on every review and usually appears directly below the title. This will take you to a different page where Google allows users to report policy violations. 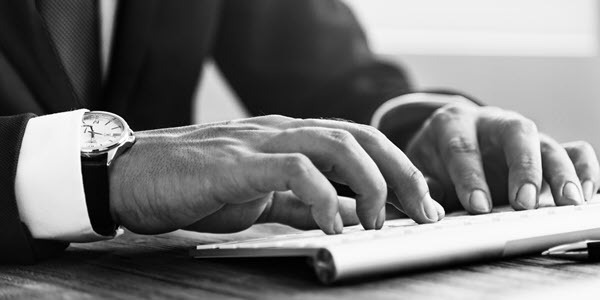 Leaving behind fake reviews or distributing inaccurate information regarding a company is considered policy violation. Choose the type of violation and enter your contact details. It’s a good idea to find other people to flag it as well because that increases the likelihood of Google noticing the issue early. Flagged reviews aren’t always removed and most business owners have to follow up multiple times. That’s why it’s important to respond to it first. 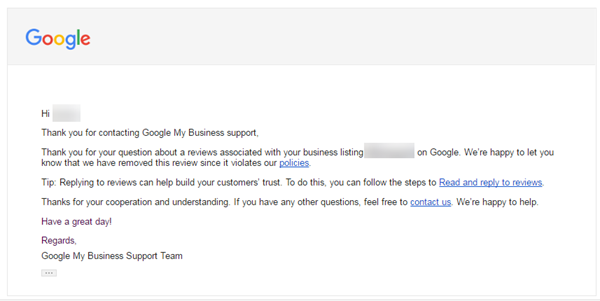 If Google checks your flagged review and agrees that it is fraudulent, the search engine will remove it promptly. 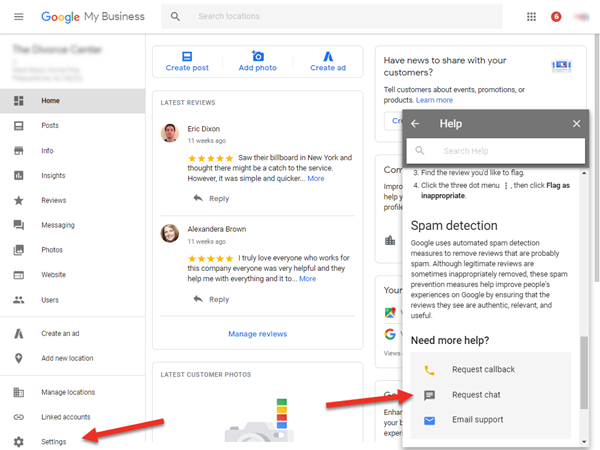 Log into your ‘My Google Business Dashboard’ through your company account. Go to the “Reviews” section, click on the “Home” menu. Select “Support”. It will be at the bottom of the page at the left corner of your screen. Choose what method of contact you prefer. Google offers both phone and email options. Include a screenshot of the fraudulent review in your message. Fill the form and provide all the necessary information before sending the message. The support team will take around 24 to 48 hours to respond. Once the Google support technician contacts you, explain the situation clearly to convince them. 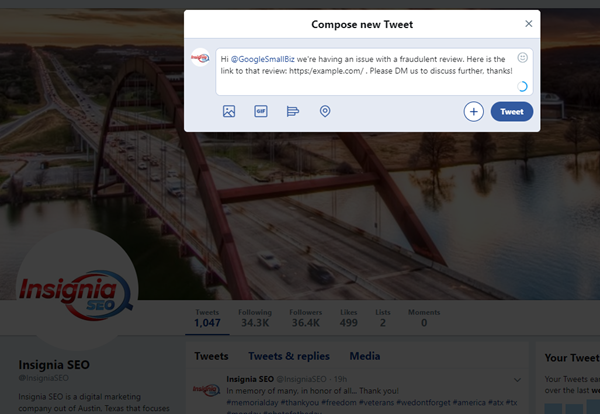 Tweet @GoogleSmallBiz with your concern. You can include a link to the fraudulent review in your tweet. Provide contact information if necessary but use only your company’s public contact handles. The resolution can be discussed via DM rather than through emails. The Google team will respond within 24 to 48 hours though you will receive an acknowledgment of your concern quickly. Explain why it is false or fraudulent. Provide evidence to back up your claim. Showcase how a review violates Google policies. Explain why it must be removed. Provide images of the review, responses, and attempts to establish communication. The technician will consider all of these aspects carefully before providing a clear solution. If they’re convinced, they’ll escalate the problem towards a “Specialist” who decides whether the feedback should be removed. Google will inform you of the decision through your preferred communication channel within a matter of days. Go to the “Spam and Policy” forum. Search the platform for questions similar to your concerns and see if any of the answers are helpful. If you don’t find a solution, ask a question regarding your fake review problem. Becoming a regular member of such Google small business communities can help you with future concerns as well. Active members of the community get ample support from other experts on a variety of online business or marketing concerns. Quick response and a follow-up after the resolution is a great way to ensure a negative/fake review has a positive impact on your reputation. Double check to ensure fake reviews are removed or have no additional comments on them. If it is a genuine criticism, follow up after the issue is resolved and ask the customers if they need any other assistance. This showcases how much effort you put into customer service and will leave a positive impression on the minds of customers. Most are willing to accept that companies and employees will make mistakes and will trust a company that handles conflicts or problems promptly more than a company with a seemingly spotless record. The best way to reduce the impact of a fake or negative review is to have a good reputation management system in place. 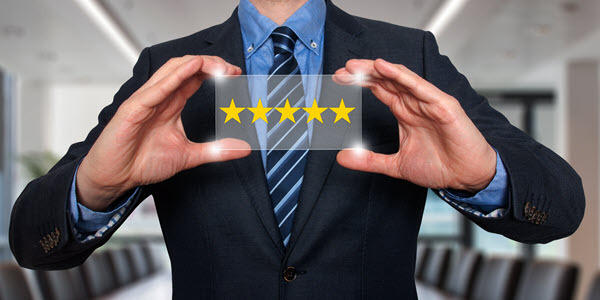 Customers expect businesses to have some negative feedback but as long as positive comments far outweigh the negative ones, your company will have a good reputation. Build a good reputation by requesting customer feedback. Engage positively with customers that have posted a negative feedback, monitor brand mentions, and actively ask for suggestions or reviews. Make it easier for people to provide feedback by providing links and quick access. 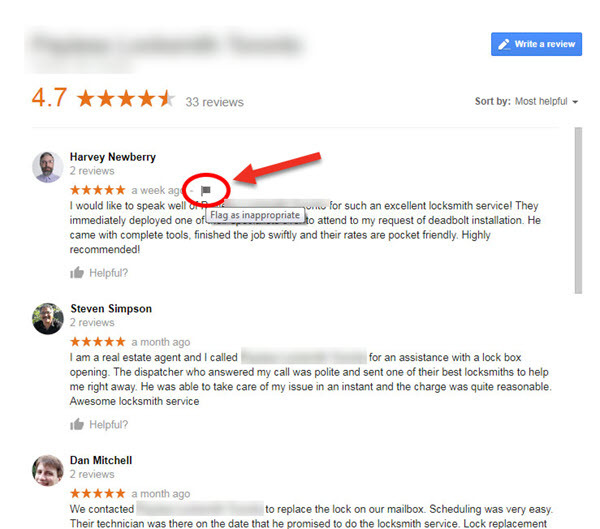 These methods can help you remove inappropriate Google reviews and maintain a good reputation online. **If you need any additional assistance, our Reputation Management services can help. Feel free to Contact Us Today!